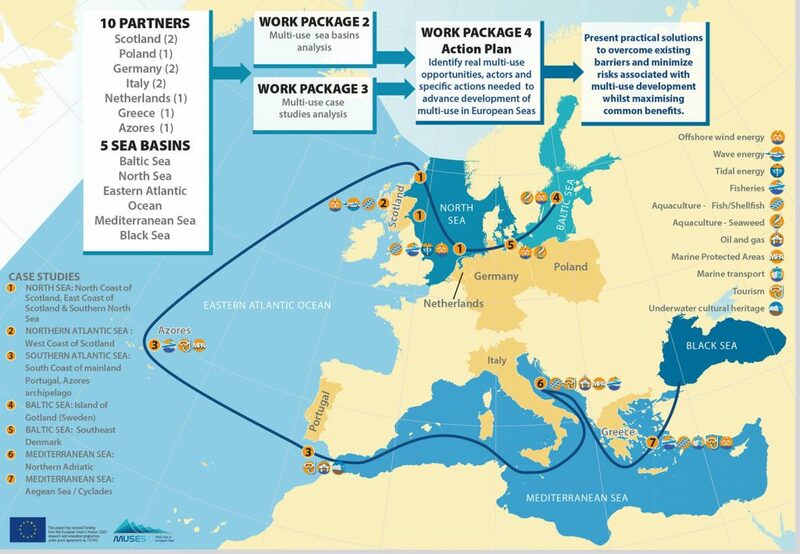 The Multi-Use in European Seas (MUSES) project aims to show the real opportunities for Multi-Use in European Seas, including scope for innovation and Blue Growth potential, from a user perspective, and to present practical solutions on how to overcome existing barriers and minimize risks associated with Multi-Use development. Regional overviews are being undertaken in EU sea basins (Baltic Sea, North Sea, Mediterranean Sea, Black Sea and Eastern Atlantic) to facilitate adoption of a common approach across the sea basins. See work package 2 for more information. A comprehensive set of case studies within EU sea basins on multi-use are being conducted and analysed to provide a complete spectrum of advantages in combining different uses of the sea. See work package 3 for more information. An Action Plan is being developed to address the challenges and opportunities for the development of Multi-Uses of oceans identified in the regional overviews and case studies. See work package 4 for more information. The project will build on existing knowledge to identify appropriate techniques to minimize barriers, impacts and risks with multi-use in our seas whilst maximising local benefits and reducing gaps in knowledge to deliver efficiencies through integrated planning, consenting processes and other techniques. This will assist understanding of many issues that need to be addressed to facilitate multi-use in European Seas and the project will provide recommendations for future action, taking into account national, regional and sea basin dimensions.